Fierce fighting is raging in southern Afghanistan, where national security forces with the help of the U.S.-led foreign military coalition have undertaken a counteroffensive to halt Taliban advances. Local officials said Friday the fighting has left about 150 insurgent fighters dead or wounded. 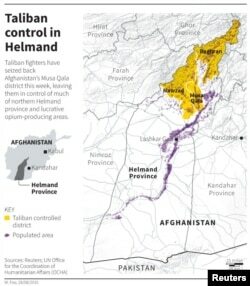 Map locating Taliban controlled districts in Helmand province of Afghanistan. The Taliban earlier this week overran parts of a strategically important Musa Qala district in Helmand province, clearing the way for the insurgents to advance on the provincial capital of Lashkargah. NATO’s Resolute Support mission confirmed that U.S. aircraft repeatedly bombed militant positions in Musa Qala while some foreign soldiers are assisting the Afghan ground forces. Earlier this week, the militants assaulted the district from all sides and killed as many as 35 Afghan soldiers before seizing control on Wednesday, according to Afghan provincial authorities. The Taliban already controls another district in the province called Nawzad that officials said facilitated the insurgents’ march on Musa Qala. The Islamist insurgents have made battlefield gains in Afghanistan and inflicted heavy casualties on national defense forces since the end of the NATO-led combat mission in December 2014. The Taliban, however, has not been able to maintain for long its hold on territories it has captured. Afghan President Ashraf Ghani’s efforts to seek a negotiated settlement of the conflict have not yet produced results, and Taliban advances, critics say, need to be halted to push the insurgency towards peace talks. Taliban spokesman Zabihullah Mujahid reiterated in a statement its violent campaign continues because the “occupation” of Afghanistan has not ended. He was referring to the presence of NATO-led, mostly American forces in the country. Mujahid would not say if the insurgent group is ready to hold direct peace talks with the Afghan government. Instead, he said that reasons for continuing the insurgency are very much present. The Taliban has linked its campaign to the complete withdrawal of international forces and the installation of an “Islamic government” in Afghanistan. President Ghani, however, rejected any compromise on the state structure in the country, saying it is in place in accordance with a constitution fully in accordance with Islam.